It is 10 AM when our team arrives in Dar Salam district where Caritas food distribution is taking place. The Caritas Mali team responsible for the distribution welcomed us warmly. The sun is already high, the beneficiaries wait in the shade for the beginning of the process. Among them, Oumou Diarra, her husband and six children are from Kidal , they all left town when the rebels took over. In Kidal, she was running a restaurant with her husband. Today, unable to find an income-generating activity in Bamako they are standing on line . They were given three bags of 50 kg of rice, 33 kg of beans, a can of oil, allowing the family to be fed for two months. Beside her, Ouseinou Maiga fled the Gao region because of the war with his wife who is suffering from disability and her two children. Ouseinou, a farmer, tries to find odd jobs on a daily basis to meet their needs. He received a bag of 70 kg of rice, beans and oil. Although he cannot vote on Sunday, as he did not received voting his card (NINA), he is hopeful that the situation in Gao will normalise after the election of a new president. 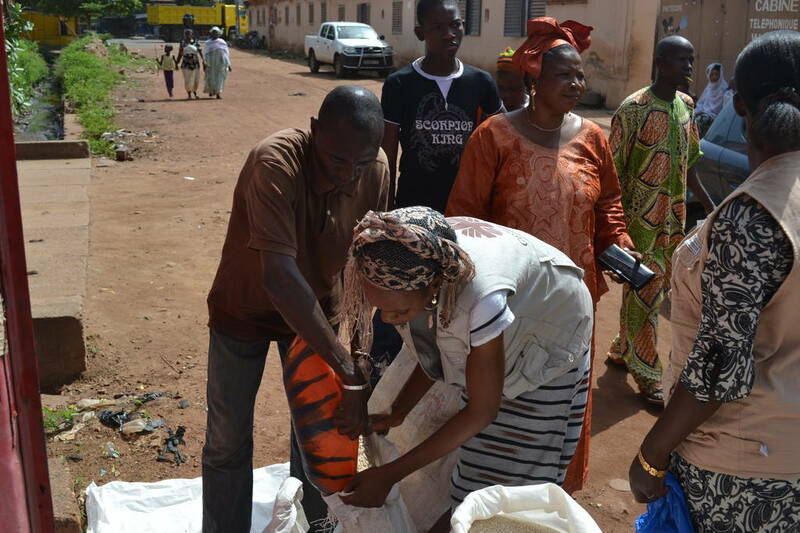 The program, supervised by Jacques in Bamako, an employee of Caritas Mali , began last May and covers 382 beneficiaries. Distributions are held once a month. The distribution is a response to the recommendations of the last meeting of the Steering Committee of the Emergency Appeal (EA) made from 24 to 26 June. It comes in three parts: humanitarian assistance to internally displaced persons (IDPs), refugees and local communities around the camps, building technical skills and operational capacities of Caritas Sahel, and improving coordination in crisis management. The original and collaborative approach of the four Caritas Sahel group (Mali, Burkina Faso, Niger and Senegal) will provide an appropriate response to many families in distress. Let us pray that the word “hope”, now on everyone’s lips at the thought of the upcoming election, will have a concrete and practical resonance for all beneficiaries of the program, but also for all the people of Mali.